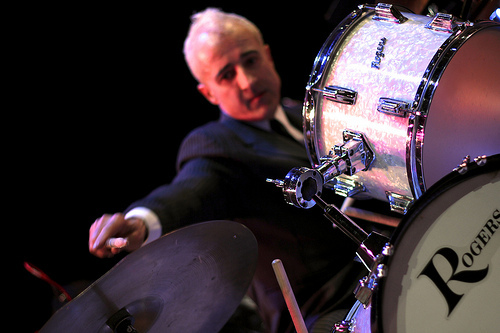 Interstitial Arts is excited to bring you this interview with composer/performer Bobby Previte. Bobby has worked with for/with creators as diverse as John Adams, Terry Adams, Robert Altman, Johnny Copeland, Lejaren Hiller, Charlie Hunter, Lenny Kaye, John Lurie, Sonny Sharrock, Michael Tilson-Thomas, Tom Waits, Victoria Williams, and possibly Iggy Pop (though he can’t quite remember that.) He has recorded on Sony, Nonesuch, Palmetto, Gramavision, Enja, Thirsty Ear, New World, Ropeadope, Veal, Spacebone, and received the Guggenheim Fellowship. He’s in the midst of creating a recording of his highly interstitial work Terminals, and took a few minutes to speak with IAF Board member Deborah Atherton about it. 1) Can you introduce yourself and give us a little background on who you are and what you do? 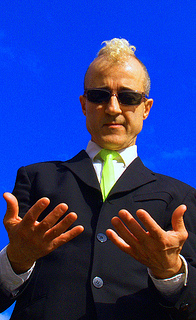 I am a performer/composer. My “instrument” is the trap drums. I’ve been performing since the age of 13. I got my start playing all of the bars, clubs and after hours joints in my hometown of Niagara Falls, New York. I fashioned my first drum set out of garbage cans and whatnot, and I learned how to play on the street and from my comrades-in-arms. Later I went to the University of Buffalo and studied percussion with Jan Williams, which was incredible, but I don’t think I learned as much about playing or writing music there as I did about how to listen. And listening is everything. 2) Please talk about your latest project, Terminals. Terminals is an attempt to marry two profound influences in my life: my time in the percussion department, and the entire 40 years afterwards, where I was lucky enough to stand on stage next to some of the greatest improvisers in the world. I never seriously considered being a classical percussionist (nor could I have been, starting much too late), I was a drummer through and through. But Buffalo in the 70s was the epicenter of new music in the US, and as a young rock/soul/r&b drummer, passing John Cage, Morton Feldman, Lejaren Hiller et al in the hallways was transformative. I mean, I had no idea who these people were. I was totally clueless. Then, I found out. After school I immersed myself in the life I pretty much lead now - traveling the world, writing, playing, performing, recording music. I forgot about percussion music really. Then one day I was on one of those long flights, and, completely bored, I picked up the in-flight magazine and came upon the Airport Terminal Maps you see all the time, graphic representations of physical spaces. Suddenly I saw them as percussion set-ups. Circle hubs became bass drums, long hallways became chimes, like this. Now I had always been fascinated with airports. As a child I would arrange random objects as airports and cities, and my friends and I used to climb the fence of the Niagara Falls Airport, sneak on to the runway (can you imagine such a thing now) and lay down on the grass as the planed boomed overhead. Aside from certain hearing loss and probable brain damage from jet fuel contamination, it was exhilarating. In any case, I decided then and there to write a Percussion piece. I mean, on the plane looking at the maps. But I wanted to incorporate the rest of my life experience into the work, so I hit upon the idea of writing concerti for improvising soloists and percussion ensemble, where the percussion group takes the role of the orchestra in a traditional concerto. First, I wanted to get SO Percussion on board. Luckily they agreed. I’m not sure I would have even attempted it without them. Then I had the pleasure of deciding who amongst the many many people I had played with I would write for. In the end I wrote five concerti, one each for the harpist Zeena Parkins, the vocalist Jen Shyu, the turntable artist DJ Olive, the keyboard maestro John Medeski, and one for myself on trap drums. Each of the Terminals is very tailored to the solo instrument of course: John’s concerto had a lot of big forces in it to match his power on the Hammond, while Jen’s uses a lot of ‘vocal quality’ instruments like the talking drum, the whistle, and and the cuica. The drum set concerto is all about the experience of playing the drums, from dropping your stick, to the “rock count-off’ to even setting up the set: within the piece we set up and soundcheck on stage in real time a second drums set. This satisfies one of my biggest fantasies - having the soundcheck during the gig! If only. This bit of theater is appropriate, as the trap drums have a history of theatrical presentation (here I could go on about my ‘super rock costume’ which my 14 year old girlfriend made me, but I will spare your readers). Well as an Italian promoter (and good friend) once told me, “Bobby, I love you, but you are so hard to book. I’m never sure what you will bring. An electronica project? All acoustic? A metal band? Jazz?” Myself I hear all these things, to me they are all just part of my world. However it does make it hard for people. Folks get very nervous when they can’t define. We all feel if we can name it, if we can find our exact GPS positioning, we’re ok (it’s an illusion, but whatever). Nobody likes to be lost, even a little bit. Which is somewhat of a shame, don’t you think? Because isn’t that really what’s at the bottom of the whole experience of art, of life? I mean, there’s a place, a very needed place, for stability, familiarity, etc., but if you always know what’s gonna happen next, who cares? Art is one of the few areas in which you can take a risk, precisely because it’s not real life. If you make a mistake what will happen? You’re probably not going to be knifed in an alley or smash into a telephone pole with your car or lose your entire fortune or overdose on some exotic drug. So why the hell not take a chance? You might actually find something. But it’s just really hard for us. We work too-long hours, beaten down at our jobs every day, and then it’s just enough to escape back home and anesthetize ourselves with a beer and some moving images. Forget it all. Tomorrow’s another day. In this environment, who wants to be asked more questions? This isn’t really an answer to your question, but it’s a good rant, no? 4) What strategies have you used to get around this? What advice would you give to another artist in a similar position? Oh that’s tough. Strategies are for golfers and hedge fund managers. Would I point them to what Basquiat said? Something like, “You want to be famous, successful? OK, find one thing that the world accepts. And then, repeat it ad-nauseum for the rest of your life.” Theres a lot of truth in that. Branding is no joke. Simple, understandable work that can be easily branded is rewarded – complexity, hmmm, not so much. Maybe I would say, ‘make your reputation and then you can do anything.’ (though I don’t really work that way, I’m not built for it). I haven’t followed this advice, and sometimes, believe me, I wish I could, but, there it is. Probably I would demur giving advice at all because I don’t think it’s constructive, and it can be downright dangerous (look at “universities’!) – what works for one person is an unmitigated disaster for another. That’s what I would say. No matter what anyone else tells you, there is not one way (or two, or three) but many, many ways. Which is right for you? Time will tell. But it really depends on your motivation – why do you want to be an artist in the first place? Because it ain’t for sissies. It’s really a hard life if you are expecting worldly riches, and you had better love it. No, you don’t have to love it, you just have to be stuck with it. By that I mean it has to be the only thing you can possibly do with yourself. If it isn’t, if you can be just as actualized doing something completely different, I would say you’d better give that other thing some serious consideration. 5) One Wish: If you could change one thing about your current situation (i.e., getting this recording done or really whatever you would like to talk about!) what would it be? I would love to be specific here and say, hey everyone, I would like to finally record Terminals, and I’m having a pledge drive to do just that, and here’s where you can donate, http://www.pledgemusic.com/projects/terminals (ha ha, see what I did there?) but that seems such a silly, small thing. I mean, isn’t everyone’s next project just silly as compared to the grand scheme? Or is it just part of the scheme? Well, to stop skirting the issue, I will say I would love to not have to get on a plane anymore, and I would love to not have to talk about my work anymore (although this has been fun Debbie). One gets (or should get) tired of it always being about oneself. Unfortunately (for most) that’s part and parcel of the life of the artist – self absorption. It’s not exactly healthy, but that’s what it is. Somehow I would like to get away from that but you see, if you don’t talk about yourself, post on facebook, and do the ten billion little things you need to do to remain relevant, the world will (usually) not let you do the one thing you really want to do – in my case, make music. Ask any filmmaker. They don’t really make films. They are professional phone bank operators, constantly scouring the globe for funds. This, yes indeed this, is what I would change if I could. This entry was posted on Sunday, January 19th, 2014 at 4:59 pm by InterstitialArts and is filed under Artists & creators, interviews, Music. You can follow any responses to this entry through the RSS 2.0 feed. You can leave a response, or trackback from your own site.